But remember this: you will not be tested beyond that which you can handle (1 Corinthians 10:13). You will not be lead into battles you cannot win, nor are unable to fight. You will only be lead into conflict you can overcome. Every battle that you encounter, is always a temptation to rely upon self or rely upon God. Every single one. These are the battles wherein God is demonstrating who He is to you. There are battles wherein we are to we are wrestle against the enemy. These are the times when God is demonstrating who you are in Him (Ephesians 6:10-18). That testing of your faith, the conflict that's wearing you down? You need to understand that since you're in the midst of it, you're already an over-comer, a victor. You're in the midst of something you can beat, win and conquer. The devil may be seeking someone to devour, but not everyone is devoured. So stop sulking and start living. 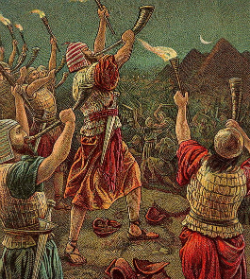 Consider that the Hebrews were lead away from the Egyptians, but lead into battle for the Promise Land. Why? They were already defeated against the Egyptians - in their minds, they were slaves, victims, they had already lost: it was a battle they could not win. The first battle for the Promise Land was a shoe-in, but they missed the blessing because they did not have faith - they did not place their trust and confidence in God. So, don't miss your blessing. Know that there are always two trees in your garden: there must always be something that comes against the promise. Because without conflict, without choice, there is no growth. In the process of the battle, pruning/cleansing will take place (John 15:1-5) to remove away those things that don't look like Him. To what do you give your voice, your heart? The doubt, or the God of the promise?